Plants are the Strangest People: Anthurium no. 0564 "Shannel"
From time to time, I get comments on posts, or e-mails, to the effect of, geez, your post today makes it sound like you must be [miserable, overwhelmed, depressed, stressed-out], what with all the [scale, thrips, fungus, ugly blooms, other disappointments or catastrophes]. I'm usually surprised to hear this, because however much complaining I may have been doing, I wasn't actually miserable. Then I wind up preoccupied for an afternoon: am I being too negative? Am I depressed and just haven't realized it yet? Etc. It's also the case, a bit less often, that people will comment to the effect of wow, your place must be beautiful, what with all the flowers and stuff, I bet it's just AMAZING to live there. Which is also surprising to hear, because, you know, to me it's just my house, and the plants are just things in the house, like walls and doors and plumbing. I mean, sure, I recognize that this house is different from other houses I could be living in, and I could hardly forget about how much time it takes to maintain them all, but I'm not blown away by how amazing it is to have a house full of plants when other people don't, any more than I'm periodically blown away by how amazing it to have a toilet when other people don't, or stopped in my tracks by the overwhelming beauty of the front door or something. Toilets, front doors, and shelves filled with plants are all utterly ordinary things in my world, and it makes no sense to think that they might not be there. 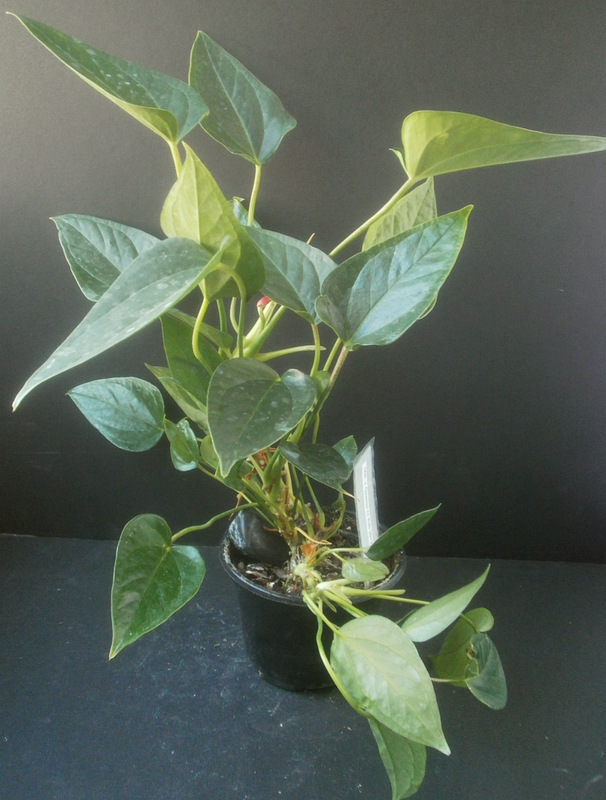 The point being that what you, as a reader, might imagine a house full of Anthurium1 seedlings to feel like is different from how it actually feels to me. I do still get depressed, frustrated, jubilant, or excited about things that happen here, of course, but the threshold for what's needed to trigger a feeling is really high. At least some of this is due to something I think of as the "Texas Effect." The Texas Effect is so named because the first place I remember hearing it articulated was in a column by the late, wonderful Molly Ivins. I don't have the exact quote on hand, but it was something to the effect of Texas being so big that it was not at all unusual for the state to be both flooding and in a drought at the same time. In the same sort of way, it's perfectly normal for my plant collection to leave me despondent and jubilant at the same time. There are occasional moments when most of the news has been consistently good for a week, and some seedling or another has done something particularly surprising and wonderful, and I think I'm finally on top of the scale situation (and the other situations) and I'm fairly happy; there are more frequent moments when most of the news is consistently bad for a week, and all the blooms are coming up pink / pink,2 and I truly am mildly depressed and discouraged over how I'm never going to get rid of the scale (and the other things). 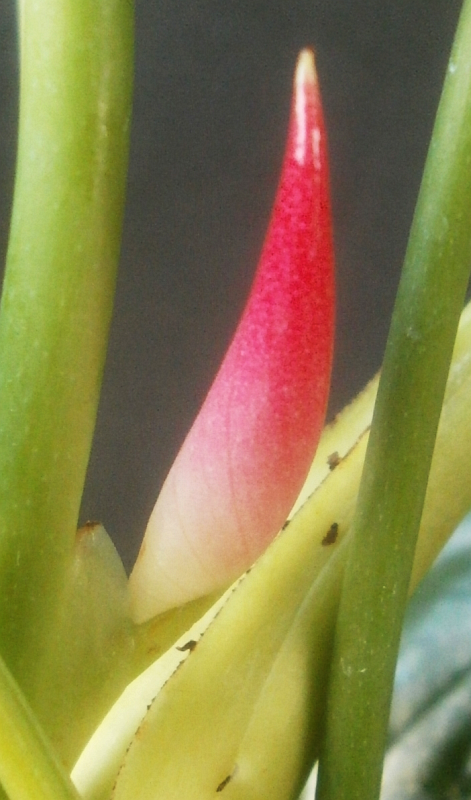 But my moods are mostly, if not completely, divorced from what the Anthurium seedlings are doing. 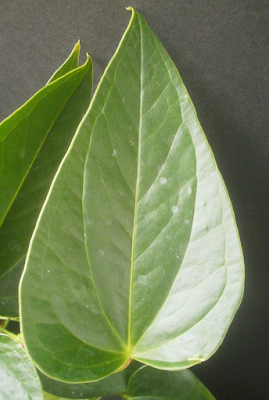 Seeing scale on one plant is nothing. Even throwing out one plant is nothing. Having one nice new bloom is very nearly nothing. Shannel is not a keeper. The bloom started out tiny, and ragged around the base. It's not an interesting color. There are thrips scars. As it ages, the spathe flips backwards, curls under in the ugliest possible way, and tears itself some more. -- though the leaves are fine, maybe even pleasant, individually. The most attractive things about Shannel, actually, are her buds. I don't ordinarily bother to provide photos of the buds in these posts, because . 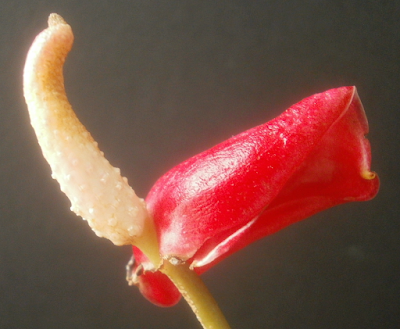 . . well, because you can usually guess what the buds look like pretty easily from looking at the finished bloom. Red blooms have red buds. Pink blooms have pink buds. Big blooms had big buds. Sometimes the color might change (at least one pink bloom, 0040 "Ivy Winters," consistently had orange buds, and I've seen an orange bloom with pink buds very recently), but had you asked me what makes for an attractive bud, say, six months ago, I wouldn't have even really understood the premise that buds can be attractive. But of course they can. And if Shannel's spathes only stayed white at the bottom, with a red tip (like some of the A. kamemotoanum hybrids I mentioned a while back), I'd be excited about keeping her around, but sadly, that's not the case. 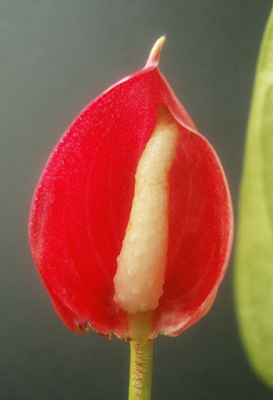 So, she's most likely a failure, though she was exempt from round 1 of the (just-completed) Anthurium-seedling purge because of the developing flower. I would not bet on her to survive round 2. The point, though, is that this -- crappy bloom, throwing out seedlings -- is balanced out by other blooms that look good and are doing interesting things. I guess it's about time I showed you another one of those then, right? So I'll do that on Wednesday. 2 I shouldn't complain about the pink / pinks as much as I do; they're perfectly nice on their own terms, and it's totally a case of familiarity breeding contempt. They're not even all bad: 0241 "Megan Gigaterra" is a pretty nice pink / pink, for example. I just get bored. Also, a lot of the smaller and more thrips-ravaged plants in fact are pink / pink, which is possibly making me like the bigger, cleaner blooms less by association somehow. 4 Shannel was divided from 0050 "Roxxxy Andrews," and so is either identical to, or siblings with, Roxxxy. I should probably say was identical to or siblings with: Roxxxy was thrown out in the first round of the 4-inch seedling purge, a week and a half ago. Why? Almost entirely because Roxxxy had absurdly long internodes. (And then also because she was old and had not yet bloomed, but that was a prerequisite for getting on the list in the first place and so doesn't count.) So are we surprised by Shannel's internodal length? No. We are not.